Brunch is on us, folks! Members of the Pharmacy Services’ North Clinical Practice Leader (CPL) team strike a pose at Ronald McDonald House in Edmonton. Top row, from left, are: Mary Gunther, Margaret Gray, Meghan Mior, Cathy Biggs, Margaret Ackman and Chloe McMillan. Lower row, from left, are: Kirsten George-Phillips, Stacey Ginther and Mark Diachinsky. 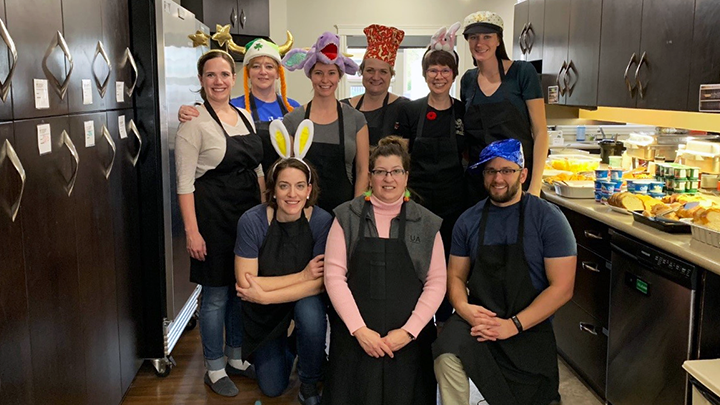 EDMONTON — When it comes to making Sunday brunch for more than 40 families at Ronald McDonald House, the members of the Pharmacy Services’ North Clinical Practice Leader (CPL) team love to roll up their sleeves, fire up the kitchen and whip up a feast. Recently the team served up a mouth-watering spread: two types of French toast, oatmeal, scrambled eggs with toppings, fresh fruit, a charcuterie board, sausage and bacon. It’s all part of the Meals that Mend program, designed to provide comforting meals to families who are staying at Ronald McDonald House while their children receive treatment at Stollery Children’s Hospital. Margaret Gray, manager of the North CPL team, says her coworkers were motivated to support this particular charity due to their work in pediatrics. Meeting families and seeing their reactions made an impact on the group, says Kirsten George-Phillips, a CPL at the University of Alberta Hospital. Over the years, the CPL group has been involved with many charities, the Edmonton YWCA in Edmonton and Santas Anonymous. See more information on the Ronald McDonald House Meals that Mend program.